Earlier this year, the Matsés indigenous people rejected Australian businessman ‘s offer of billions of dollars in return for handing over the rights to the carbon stored in their forests. Apparently in retaliation, has now filed a criminal complaint against the Matsés chief of the community of Estiron, Daniel Jiménez. AIDESEP (Inter-Ethnic Association for the Development of the Peruvian Amazon) previously rejected ‘s proposed deal with the Matsés people and demanded his expulsion from Peru. In a statement on its website, AIDESEP describes the criminal complaint as “yet another assault on the indigenous people who defend the planet from climate change”. Click here for the non-censored version of this post. Below is a translation of AIDESEP’s statement and the notification of the criminal complaint (translated to English and in Spanish). Click on the image below for the original notification. Meanwhile, two articles from the Courier Mail provide more information about ‘s past. The first article, dated 15 November 1996, describes how was accused in Australia’s Parliament of a land scam. In the second, dated 22 February 1997, a public servant says of , “I wish I never met him.” Click on the images below for the articles. In Parliament, then-Member of Parliament Jim Pearce accused of selling non-existent plots of land to people from Nauru. The tiny island is a phosphate rock island in the South Pacific Ocean. The phosphate was mined for decades, leaving little more than a moonscape. But the money from the mining made the people of Nauru rich, at least until the phosphate ran out. He left with over $1m in investment, false promises etc. He made fools of the innocent and simple Nauruan investors. He did so in the most calculative manner to divest them of their monies forever. Some people tried to go after him but found his tracks were difficult to follow. Soon after he left he disbanded the Darling Downs Development company without a trace of assets etc. I suspect it was a shelf company worth $2. claimed the affair was overplayed by the Queensland Labor Party, because of ‘s association with the head of the state’s Premier’s Department, Peter Ellis. “Jim Pearce is taking a pot shot at the government by aligning me with the co-ordinator general,” he said. How about you take the time to interview me and get the really facts you have never tried to contact me. All you have done is copy some one elses false and missing leading statement made some changers to suit yourself no research. REDD-Monitor has sent a series of questions to and looks forward to publishing his response in a future post on REDD-Monitor. AIDESEP, July 21, 2011. In what represents yet another assault on the indigenous people which defend the planet from climate change, the Matsés chief of the community of Estiron in the Loreto region, Daniel Jimenez, was denounced by an Australian citizen, , in revenge because the indigenous leader did not accept his suspicious offers, but instead, asked the Office of the Defender of the People to investigate this person who offered “big profits” to the indigenous communities through the sale of carbon offsets. The plaintiff ( ) has a history of committing fraud in the Nauru and Malaysia by selling land without titles, as well as having been denounced in the Parliament of Queensland, Australia because he lied in various foreign countries that he had the support of his Government’s officials for off-shore land sales. According to the investigations of a technical team of AIDESEP, has a company that is incorporated in Hong Kong, although he does not live there nor does he have a physical office in the area. The connection of this Australian citizen to Peru dates back to October 2010, when he arrived in the country and he made a business offer to the Regional Government of Loreto for a carbon offset deal and to share the profits 50-50. The regional Government requested for him to show the financial sources for this project; however, he could not do so and the project did not materialize. In light of this failure, returned to Peru in February of this year, made contact with the Matsés Native Community and insisted on their participation in his project. However, Daniel Jiménez, chief of the community of Estiron decided to go to the Office of the Defender of the people and to AIDESEP in order to consult about the feasibility of the project and whether it was normal for a person to propose a business deal where the documents that were to be signed were written in English. That was the sin of Jiménez: to request for information, and for this reason, has filed a criminal complaint against him in the 5th Joint Provincial Criminal Prosecutor of the Maynas Province. Given this fact, AIDESEP has made a commitment to provide legal support to this brother who is being accused in revenge because he exposed a person who owes many debts to justice. By means of the present document, you are duly NOTIFIED, in order that you meet before the V-FPM-Maynas situated in Morona Street No. 148, on the day of Monday, 18th of July 2011 at 10:00 of the morning, in order to carry out the evaluation of the merits of the complaint filed by the person of (Australian National) for the alleged crime of coercion, violation of correspondence, aggravated theft of property, fraud against the State, extortion in the form of blackmail, aggravated computer crime, false statement against justice, false administrative declaration against the public faith, forgery of private documents and generic falsehood in grievance of Mr. .
Angamos Colony, 13 of July 2011. 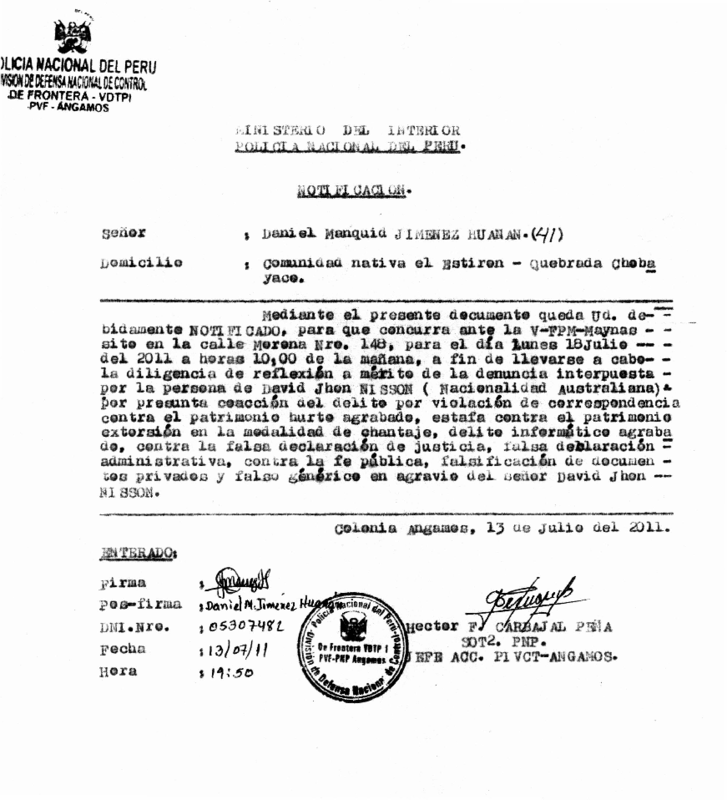 Mediante el presente documento queda Ud. debidamente NOTIFICADO, para que concurra ante la V-FPM-Maynas sitio en la calle Morona Nro. 148, para el día lunes 18 Julio del 2011 a horas 10:00 de la mañana, a fin de llevarse a cabo la diligencia de reflexión a mérito de la denuncia interpuesta por la persona de (Nacionalidad Australiana) por presunta coacción del delito por violación de correspondencia contra el patrimonio hurto agravado, estafa contra el patrimonio, extorsión en la modalidad de chantaje, delito informático agravado, contra la falsa declaración de justicia, falsa declaración administrativa, contra la fe pública, falsificación de documentos privados y falso genérico en agravio de Señor . Colonia Angamos, 13 de Julio del 2011. UPDATE – 7 August 2011: Yesterday, REDD-Monitor received a copy of the original notification (dated 13 July 2011) complete with translation to English. This has therefore been substituted for the notification previously posted (dated 15 July 2011). UPDATE – 10 August 2011: This morning, REDD-Monitor received an email from its web hosting provider, bluehost.com, stating that they had received a “report of Terms of Service Violations”. Bluehost demanded that all images and references to the name of a certain “carbon cowboy”, who was recently reported to be operating in Peru, be removed from the website. This seems to be a serious infringement on the right to freedom of expression. REDD-Monitor is currently discussing this issue with Bluehost. The extent of fraudulent REDD schemes that have sprung up around the world seeking to leverage carbon assets as futures options on Over the Counter (OTC) exchanges is quite considerable. This type of situation is echoed at various locations around the globe. REDD ++ were countries seek to be REDD ready for business under UN guidelines is a nightmare for developing regions that in turn leads to more deforestation or exploitation of resources, people and wildlife. Logging companies own and control large portions of the worlds media , the UN REDD+ with the World Bank think they have global agreed consent which consists of every other issue and agenda EXCEPT avoideforestation and forest area biodiversity and hydrology protection. The REDD and + plan is to acquire and control land tenure. could never take their land from them , but most certainly with help of the World Bank the UN donor countries WILL. The world is broke , its back to basics Western Countries are looking for several mineral commodities to extract or mine or any other method of making easy money , if any one ever thinks that forest protection is important to our supposed world leaders and polluters then think again. why is the carbon cowboy still alive ?? i hope one of the natives shoot a poison dart into his neck just like they do to the monkeys.. Guys like this deserve a fate wrose than hell.. How dumb does he think the world is.. it would cost 50cents in total to end the whole problem.. feed him to the Juguars..